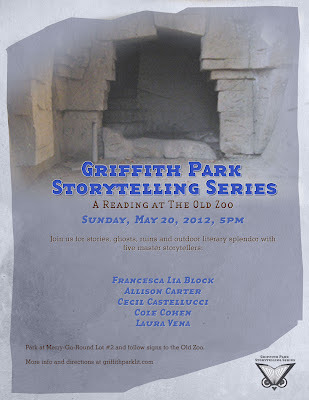 Sunday, May 20th, 2012 at 5:00 p.m.
Five writers will read their work amidst the creepy and beautiful ruins of the Old Zoo. The Independent Shakespeare Company has detailed maps and directions to the Old Zoo. They also have hot pink signs up which point the way to the Old Zoo. Continue walking straight through the trailheads towards the picnic areas. We will, hopefully, be in the first large nook with the picnic tables (the first picture in this post). If not, we will be in one of the other enclosures. There will be a partial solar eclipse taking place as the reading ends. It looks like the height of the eclipse will happen just after 6:30. We will have some solar-safe glasses on hand to share! We will most likely walk up a steep hill to get the best view of the eclipse. Allison Carter is the author of two books, A Fixed, Formal Arrangement (Les Figues Press) and Here Versus Elsewhere, forthcoming from Insert Blanc Press; and three chapbooks: Shadows Are Weather (Horse Less Press), All Bodies Are The Same and They Have The Same Reactions (Insert Press) and Sum Total (Eohippus Labs: n°5). Her work has otherwise been published in Conjunctions, Joyland, P-Queue, 5_Trope, Fence, 3rd Bed, and other journals. She studied at Brown University and at California Institute of the Arts. Allison Carter currently lives in Los Angeles, CA. She teaches creative writing and conducts outreach at Reasons Eating Disorder Center. Cole Cohen received her MFA in writing from CalArts in 2009. Her memoir about being diagnosed with a rare neurological condition three months before starting her MFA was a nonfiction finalist for the 2011 Bakeless Prize and the 2011 Association of Writers & Writing Programs Award. She was a 2010 Yaddo Fellow and is currently the Programs & Events Coordinator at UCSB’s Interdisciplinary Humanities Center.